Saves attached messages and other Outlook items to the specified folder. 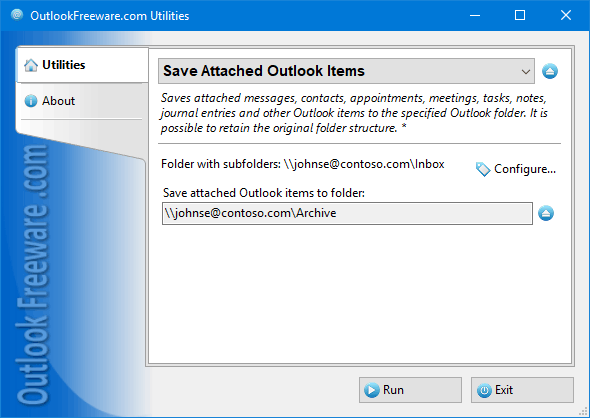 This free utility automatically saves attached Outlook messages, contacts, tasks, notes, calendar items, and history, and other Outlook items from different folders to the specified folder. When saving new items, it creates the same folder structure as the original messages. If attached Outlook items have other attached items, you can also save them separately. - Extracts attached messages, contacts, appointments, meetings, tasks, notes, and other Outlook items. - Saves embedded elements recursively (embedded items in embedded Outlook items). - When saving, creates the original folder structure. - Supports filtering by the types and dates of Outlook items. - Can mark the saved items as unread. - Add-in for Outlook gives you the ability to save items from opened or selected messages and other items right in Outlook. - Provides the additional command-line application to batch save embedded Outlook items from PST data files or Exchange mailboxes of other users. To save attachments from repeatedly attached items in Outlook first, save these items using this tool to a folder, then save the attachments from that folder using another tool we provide.